Salesforce: cannot select a picklist value, why??? When user create new record, user cannot select a value from Picklist field, what is the caused? If the object have record type, only one picklist value selected for that record type. Analysis: user still be able to select '--None--' or a picklist value. if Default value for that field in field level (object without record type) or Default value for that field in record type is '--None--', user will not see anything value in that field. if a value is selected in Default value for that field in field level (object without record type) or Default value for that field in record type, user will see the default value in page layout without option to change it. User with profile have permission "Edit Read Only Fields" will able to select available values. This is almost the same with point (2) above, the difference is only determined by user profile rather than to all users. if Default value for that field in field level (object without record type) or Default value for that field in record type is '--None--', user will not see anything in the page layout. 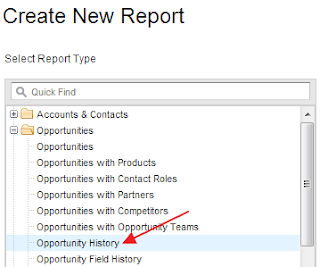 If we enable History tracking for an object in Salesforce, Salesforce will automatically create a new object with API name suffix History, example: AccountHistory, ContactHistory, Custom_Object__History. But, it is different for Opportunity, the object API is called OpportunityFieldHistory, please not to confuse with OpportunityHistory. So what is Opportunity History? In Opportunity page layout, find the related list called Stage History. This related list is not customize-able. The API object name is OpportunityHistory, you can query this object, but not update, delete or create manually. Field Dependencies is one of basic, simple, but very powerful feature from Salesforce.com and has been release long time back. This blog is not about on how to create field dependency, but more on field dependency deployment. What is deploy mean here? It is deploy from one instance to another instance in Salesforce. Then, next question, Why we need to deploy such a simple thing? Cannot we just create or update in Production instance directly? - Yes, of course you can. Okay, now we are clear why need to "deploy" such a simple thing like field dependency. Use case: a global company present in many countries and cities around the world. Both country and city is picklist value, city must be valid only for a country, this is pretty basic and field dependency is best solution available city value is dependent on country selection. Since company is growth very rapidly, admin need keep to update city within country, or even remove city which no longer valid. I believe you can do the same using Force.com IDE to deploy, similar result using Change Set. Notes: if you have records with old dependent field which no longer there, the old value will remind there until you update it manually, so don't afraid this exercise will update all existing data. If you have Record Type on that object, you need to add the new values in Picklists Available for Editing, otherwise the new picklist values will not shown in page layout, although it is added in Field Dependency. What is the most easy way to get user attention in a Salesforce page? One of the best option is to use image. You can build Visualforce page (and with Apex code) to display images in Salesforce page. But, hold on, Visualforce is not the only way to display image. You can use IMAGE() in a formula field, this is much more easier and faster if possible. If a customer purchase support product and still active, show active sign, if no longer active, show expired sign and if not purchase any support, show cross sign. For this case, you need to upload 3 images into a document. I'll not discuss on how to upload images to a document folder. But, you can look from think link, please note the max size for document only 5 MB. Basically, parameters for id = Image Id and oid = Organization Id, you can get the URL from document page. At the image field, right click and select "Open image in new tab" (for Google Chrome). Name the field "Closed Won Amount"
We can use any field, include Lead custom field as hidden field using same format, but you need to change the name with the correct Field Id. How to get field id? Go the Setup menu - Customize - Leads - Fields, scroll down and look for the field and click the field name.